Brevent is a mountain in France. From Chamonix city, one takes the gondola lift to Plan Praz at 1999 m. and from there, the cable car to Le Brevent which is situated at an elevation of 2525 m. The Plan Praz is the departure point for excursions to Lake Cornu, and Grand Balcon Sud. It also has a take-off area for paragliding. From the top of Le Brevent, a footpath goes to Aiguillette des Houches via the Bel-Lachat mountain hut. Enjoy the panoramic view of the Alps. Adult (16+)- €29.50 and Child (4-15)- €25.10. Mentioned timings are for the cable car departure and return. 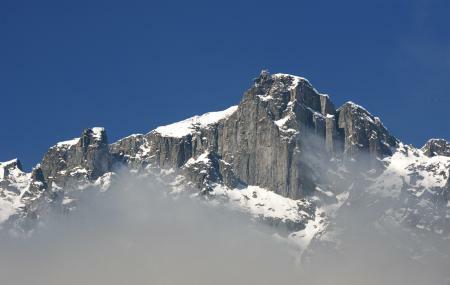 The Brevent is open to public during June to November. Seasonal dates apply, check tourist office before planning trip. People normally club together Aiguille Du Midi and Espace Tairraz while planning their visit to Brevent. Beautiful views! We were lucky to get in cable car 🚠. Even tho there was beautiful, calm and sunny day in Chamonix there was a risk that we might not go on the top. Other cable car to Aiguille du Midi 3842m unfortunately was closed due to high and strong winds. And I am glad we come here, views were absolutely stunning! Make sure you take suitable cloths when you got to the top. Weather conditions are so much different. There is cafe/restaurant on top. Great views make up for the rude service, long wait and average food. Expensive too but that’s expected given the location. Staff need a lesson in manners and hospitality. One of the best resorts in the world ... south facing so plenty of sun and aimed at the more advanced skier or boarder; accessible from the main Chamonix town its a great place to go.